The Bay Tree Closed in late 2011 / early 2012 and was fully refurbished by new owners. I could not recommend this cafe at all, the owner is notoriously rude locally, hence being half empty most of the time! It is extremely off putting to see the staff sitting outside smoking for large parts of the day. The service is awful and the food not much better and very overpriced. I will never eat there again! Such a shame for Hadleigh, I hope the many international visitors to the mountain biking do not think we are all so unwelcoming in Hadleigh! 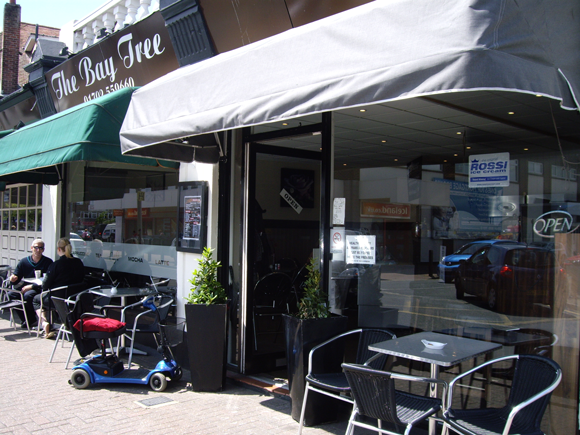 The Baytree is always busy and has many valued customers that return week in week out. The food is exceptional and value for money. The service is also friendly and welcoming. Obviously everyone has different tastes. I wonder which local coffee shop/ tea room made this review???? Part owner the Baytree cafe, Hadleigh. i also forgot to mention that the baytree has 5 stars for hygiene, a gold award for healthy eating from Essex county council. We are also licensed to sell alcohol. We provide hot meals all day from breakfast, chilli con carne, cottage pie, fresh fish and much more more.